SEATTLE (AP) — The spectacular theft of a 76-seat plane from the Seattle airport by a ground crew employee is prompting an industrywide review of how to thwart such insider security threats, though it remains unclear what steps airlines might take. 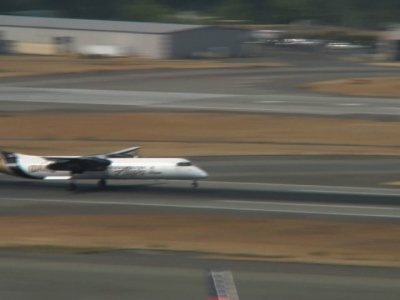 Investigators are continuing to piece together how 3½-year Horizon Air employee Richard Russell stole the empty Bombardier Q400 turboprop on Friday evening and took off on a roughly 75-minute flight, executing steep banks and even a barrel roll while being tailed by fighter jets. He finally crashed into a forested island south of Seattle. Russell was killed. No one else was hurt. In conversation with an air-traffic controller, he described himself as “just a broken guy,” said he “wasn’t really planning on landing” the aircraft, and claimed he didn’t want to hurt anyone else. She said airport officials have been in touch with other airports and airlines to begin to assess procedures. Sea-Tac has added security guards in the cargo area where the plane was parked when Russell stole it, she said. The industry group Airlines for America confirmed it is closely reviewing the incident but would not comment further. The National Transportation Safety Board referred questions to the FBI, which has released limited information about the investigation. Potential solutions could include additional vetting or monitoring of employees; changes in who can access the planes and when; having parked aircraft monitored by closed-circuit television or by security patrols; requiring electronic or digital passcodes to start a plane’s engines; or requiring locks that could prevent an unauthorized person from manipulating a plane’s throttle, experts said. Aviation professor Jeff Price of Metropolitan State University in Denver said he expects a renewed focus on insider threats and warned that there is a real possibility Russell’s actions could inspire terrorists or copycats. Countering an insider threat remains challenging, given the number of people — caterers, mechanics, cleaning staff and others — who have access to aircraft. Such workers already undergo background checks and drug and alcohol screenings. At some airports, including Sea-Tac, they are also subject to physical screenings the way passengers are. Russell was not believed to have had a pilot’s license. His responsibilities included towing and pushing aircraft for takeoff and gate approach, de-icing them and handling baggage. Many planes in service were designed decades ago and are started up by manipulating levers and switches in a certain sequence, rather than by, say, an ignition key. Experts said Russell had to have known how to start the plane, taxi and take off, but it’s not clear where he learned to do so. He told the air-traffic controller he didn’t need much help flying because he had played video games. John Cox, a veteran pilot and aviation security expert with Washington, D.C.-based Safety Operating Systems, said that given the rarity of commercial airplane theft, there should be no rush to adopt additional measures that might bog down airlines or otherwise be counterproductive. The investigation, once complete, will likely show any shortcomings that need to be remedied, he suggested. He also cast doubt on some ideas suggested by others, saying it would probably be prohibitively expensive to retrofit older planes with measures such as computer passcodes. “It’s not as simple as putting a key fob in your pocket and getting in your car and pushing a button,” he said. Cox also questioned the effectiveness of having more guards monitoring parked planes. Associated Press writer Dee-Ann Durbin contributed from Detroit.